This comprehensive Master Development System is designed to assist in the rapid evaluation and integration of the TT Series remote control transceiver module. 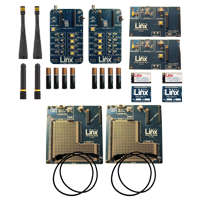 The all- inclusive system features several pre-assembled evaluation boards, which include everything needed to quickly test the operation of the transceiver modules. Two remote control demonstration boards show the simplicity of basic remote control operation and allow the range performance of the remote control transceiver modules to be tested in the actual use environment. Two programming dock boards feature a USB interface for use with included development software. This is used with the module’s serial Command Data Interface to configure the module’s advanced features. Two prototyping boards are included to support custom circuit development. These boards have headers to interface with the modules, a regulated power supply, USB interface and a large area of plated through-holes for custom circuits. The modules are mounted on pinned carrier boards so that they can easily be moved among the development boards. When the modules have been integrated into the product, the system continues to serve as a valuable benchmark against which to compare the performance of your layout and design. The system includes antennas, batteries, extra modules, connectors and complete documentation to provide everything needed to evaluate the modules, from initial testing through final design.